Scooper - Technology News: How will Africa achieve a greener future? How will Africa achieve a greener future? Africa is one of the most vulnerable regions in the world when it comes to global warming, but the continent is stepping up efforts to find solutions with backing from climate funds. Twenty-seven nations – half of Africa – have signed up to pilot programmes financed by the African Development Bank’s Climate Investment Funds (CIF), which aim to help countries and communities tackle climate change by adapting to extreme weather, adopting renewable energy and sustainable forestry. The African Development Bank’s 2015 report on its CIF portfolio says these nations, which include some of the continent’s poorest countries, are incorporating the 39 pilots into their national economic and social development goals. The report says that although Africa contributes less than 3.8% of the world’s greenhouse gas emissions, the continent suffers disproportionately from the effects of climate change. Kurt Lonsway, head of the African Development Bank’s Climate Change and Environment Division and CIF coordinator, said: “Through our CIF work, we have helped Africa's middle-income and poor countries redefine their approach to economic and social development through programmes and projects which are not only based on climate solutions but are also bankable, help change markets, engage a wide swath of stakeholders, and have a core of long-term sustainability. “We see this as a crucial change for the future, not only for the continent, but for our planet." Programmes taking place across the region include five from the Clean Technology Fund, 11 from the Forest Investment Programme, nine from the Pilot Programme for Climate Resilience and 14 from the Programme for Scaling up Renewable Energy in Low-Income Countries. These include wind and solar farms in Morocco, increasing renewable energy use in Mali, accelerating private sector investment in sustainable energy production in South Africa and developing a geothermal steam field in Kenya. The report highlights three developments during 2015 that have helped advance the CIF work. 1. Half of Africa’s 54 nations signed up to the 39 CIF pilots. 2. Countries are collaborating on CIF programmes across borders. For example, Uganda and Rwanda are working together on their CIF forest and resilience programmes. In addition, some countries are also looking to work with development partners and other funds such as the Green Climate Fund and Global Environment Facility to ensure that investment pipelines include programmes that can be funded from different sources. 3. 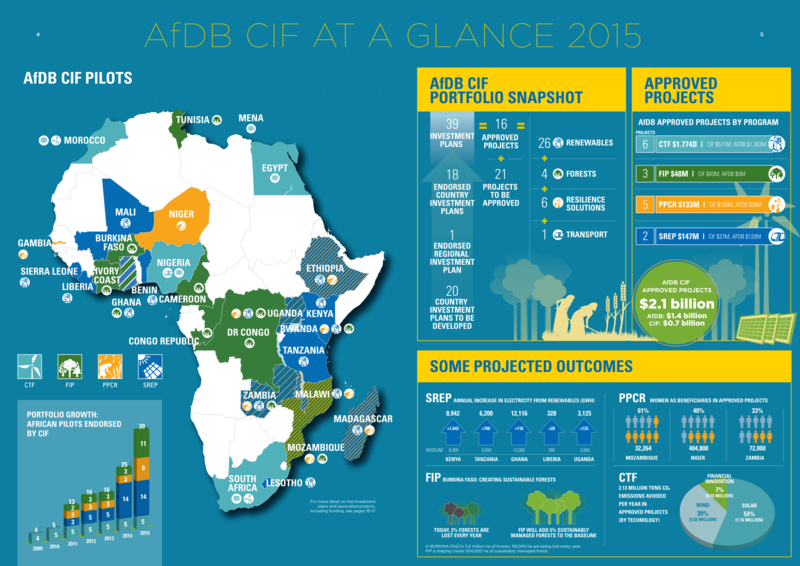 The CIF working model has helped open doors for innovative approaches and helped the African Development Bank, which aims to triple climate financing for Africa by 2020, restructure its support for Africa in a “climate-smart” way. What is the Climate Investment Funds? Established in 2008, the $8.3 billion CIF is one of the largest fast-tracked climate financing instruments in the world. It provides developing countries with grants, concessional loans, risk mitigation instruments and equity that leverage significant financing from the private sector, multilateral development banks and other sources. Five multilateral development banks – the African Development Bank, the Asian Development Bank, the European Bank for Reconstruction and Development, the Inter-American Development Bank, and the World Bank Group – implement CIF-funded projects and programmes.